got2b Fresh It Up Volume will add extra va-va-voom, along with a tropical fragrance that'll last all day. Flip your head upside down and apply for maximum volume! I am relatively new to the dry shampoo game (shock horror I know), and have tried a few different ones. This is by far my fave. I try not to wash my hair too often, I have lightened length so the ends are quite dry and I’m conscious of not drying them out any further. The spin off with that of course is oily roots in between washes. I absolutely hate that oily, dank look so this has fast become a staple in my hair routine. I’ve tried the brown one but found the scent too sickly and the brown residue too irritating on my scalp. This one on the other hand is light, fresh and doesn’t leave any residue. The scent is really nice, not too sweet or sickly. I haven’t noticed any residue - just spray along the roots, leave for a few seconds and then comb through. Beautiful hair without the hassle! My hair has recently become a little oily but my scalp is a little dry. I try not to wash too often as per hairdressers recommendation and wash every three days. The last day never looks as great so I got this to use on the day before next wash. Definitely gives it that tousled look. My hair is blonde so the little residue it leaves isn’t very noticeable but it also leaves it feeling a little sticky. Nowhere near as sticky as some of the ‘dry shampoos’ I’ve tried but absolutely needs to be washed that evening. I usually tie it up on these days as it starts to look a little flat by the afternoon. It’s definitely worth having for those days, and I imagine if you were spot on with your styling it would help create some nice looks but for the average girl, it does what it says and freshens up for that in between washes day. I got this in the last beauty vault by accident when I actually ordered a hairspray. I had previously trialed the got2b brown dry shampoo and didn't really like that, so wasn't super duper keen on this. But it's way better than its chocolatey cousin! 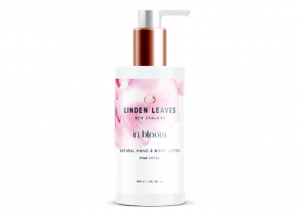 This has a delicious smell as well, kind of flowery and fresh, very fitting for a dry shampoo. It was easy to spray and gave my hair an instant lift. It's great for adding volume and some extra 'grip' when I want to do a messy bun or high ponytail. The only downside to this is it gives my dark brown/black hair a slight grey/white tinge when I spray too much. I guess the risk comes with all dry shampoos but my Batiste one isn't as obvious. Instant game changer for lazy gals like me and this comes in a decent sized can too! I love this dry shampoo it has such a nice smell to it, a tropical fruity/coconut smell, and it always leaves my hair smelling fresh throughout the day. It doesn't go powdery on my hair when I spray it and it absorbs the oils on my roots which make them look so fresh and clean. It also comes in a good size spray can which will last me awhile, I will definitely be repurchasing. I love this range of dry shampoos and I use this daily, regardless if I've washed my hair or not, actually I think this one works better for my hair when I have washed it whereas the brown one definitely works better when I haven't! Anyway, this range has never let me down, I feel confident and at the end of the day, I can give my hair a quick spray and it's fresh again. Tips: Keep one at home, in the car and in your office desk because it's that good! Beauty Review you have rocked my world! I always put dry shampoo down as one of those over-hyped products. When I'm wrong, I say I'm wrong. 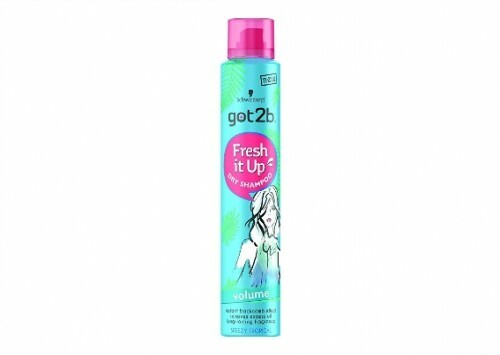 The got2b Fresh It Up Volume comes in a lovely bright can, it looks like hairspray. But the instead powerfully sprays out a powder. A magic powder! As I was gently rubbing the product in I could feel it working. My hair felt less greasy and instantly refreshed - it was incredible. The gorgeous scent lasted all day and my hair felt clean and fresh as though I'd just washed and dried it. I ended up using this for 3 days, increasing my wash time by 2 days! I'll never be without a dry shampoo again! Super great timing to trial this product as it arrived 2 days before my newborn did!! First impressions of the packaging was like wow looking very stylish in a nice Blue good size can. Love the scent - Breezy Tropical Great size nozzle. I'm not usually a big fan of dry shampoos unless I really need to use one when stuck in between washes. The packaging is fun and looks nice but I probably wouldn't have purchased it as it looks like it is targeted to a younger market. The scent as pleasant and not overpowering which is important to me as I don't want my hair products clashing with my fragrance. The spray that came out of the can was even and not powdery which is equally as important as I have had other brands that can come out too fast and thick. I can't comment on the volume, as the day I used it, i ended up tying my hair up, but I really liked that it didn't leave my hair looking white or matt dull as they can sometimes do. Overall I was really impressed and will keep using this product. I'm looking forward to using it with my hair out to test the volumising. Tips: Shake can well and brush through or scrunch through with your fingertips to work product through scalp.